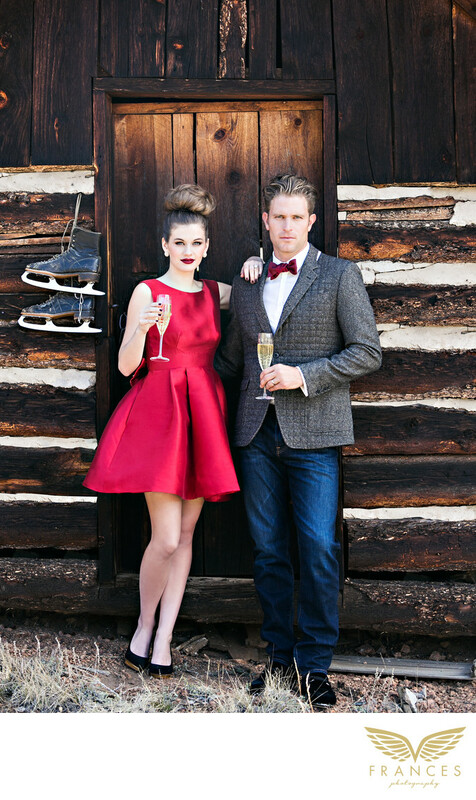 A well-dressed couple is standing in front of a wood structure during a Colorado fashion shoot. The setting is rustic; there is grass on the ground and the wood background has varying shades of brown. A pair of ice skates also dangles casually on one side of the wall. The female model is wearing a sleeveless red satin dress with a flared skirt, black pumps, and she has her hair done in a classic updo. Her lips are painted the same bright red as her dress, and she has one hand leaning over the male model’s shoulder. He is also nicely dressed in a gray blazer, a red bowtie, medium-wash blue jeans, and black leather shoes. They are both holding full glasses of champagne, indicating that this image has been captured to commemorate a joyous occasion. The Denver fashion photographer captures the coordinating poses and intimate body language in addition to the juxtaposition of the rural backdrop and the well-heeled couple. This photograph was the cover of a Reign Magazine issue.